In a combined ceremony, CBT will celebrate graduating students along with the College of Education and the College of Science. The evening ceremony will take place on Friday, December 14th, at 6:00 p.m., in EKU's Alumni Coliseum. A reception will follow in the Fred Darling Gym immediately after graduation. At the fall graduation, the College of Business and Technology honors nearly 250 degree candidates with bachelor's degrees, master's degrees, and associate degrees. Speaking on behalf of the graduating class will be Preston Spade. Preston is completing a Bachelor of Business Administration in Business with a dual concentration in International Business and Global Supply Chain Management. As a bi-cultural deaf student, Preston's experiences have been unique and inspiring. Regardless of whatever challenge he may encounter, Preston consistently prevails with a solid work ethic and a passion for learning. He has taken advantage of multiple opportunities through EKU, including study abroad trips to France, Germany, and Spain. Preston would like to thank Professor James Kirby Easterling for his guidance and expertise in the global supply chain field. Banner bearers for the fall ceremony have also been named. Laura Abi Moore will lead the college bearing the CBT banner. A marketing major and a design and merchandising minor with a 3.74 GPA, Abi said, "I will be forever grateful for my experience at EKU. From Greek Life to theatre and musicals, I truly found my home on this campus. I also found a major that I’m passionate for and awesome faculty that supported me every step of the way!" Abi has accepted a position at American Eagle Outfitter's Corporate headquarters in Pittsburg, Pa. as an Assistant Merchant. She is excited about this opportunity, believing it will be a perfect combination of the skills she learned in both her major and minor courses. Douglas Grant Thompson will carry the banner for the School of Applied Science and Technology. Grant has always had a passion for aviation and is now completing his degree in Aviation with a Professional Flight concentration. Grant said his experience with EKU has been extremely positive. "It's been challenging but at the same time incredibly rewarding. As an aviation major, I've been given the chance for a multitude of internships and opportunities. I'm grateful for all the help, advice, and mentoring from the staff, students, and instructors. From day one I felt like I found a place where I belonged. Coming from the military, EKU made the transition a very simple process." A United States Air Force veteran, husband, and father, he is grateful to be able to set an example for his child by reaching this milestone in his education and plans to continue with a graduate degree. Raquel Adriana Montalvo Perez will lead in the School of Business. Raquel is an international student from Bolivia, majoring in Business. Upon graduating from EKU, Raquel will return to Bolivia to work in a management position. She is grateful for the past four years, stating that EKU gave her many opportunities. "Getting a college degree and at the same time playing tennis for EKU has been one of the greatest experiences so far in my life. I gained incredible knowledge from such a prestigious faculty as well as lifelong friends," Raquel said. 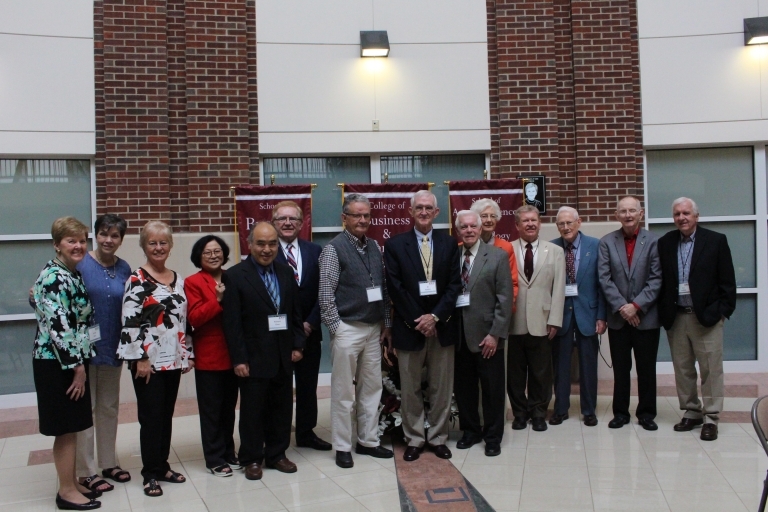 Immediately following the ceremony, a reception will be held in the Fred Darling Gym (adjacent to Alumni Coliseum) to celebrate EKU's newest alumni. Graduates, families and friends, faculty and staff are invited for ice cream and socializing featuring CBT's Biz-Tec Blast custom blend ice cream from Mad Scoops. Jason Henninger from Kentucky DJ Pros will bring upbeat tunes to cap off the evening.